measuremenTest | test and measurement: Wireless Telecom Group Introduces Noisecom VCC Noise Generator for Immunity Measurements and Specifications of Integrated Circuits. Wireless Telecom Group Introduces Noisecom VCC Noise Generator for Immunity Measurements and Specifications of Integrated Circuits. Noisecom has launched its new JV9000 series, a family of Adjustable VCC Noise Generators. Noise disturbance on Ground and Vcc planes is an increasing concern for component designers. Switching power supplies are one known culprit for power level impurities, but fast switching digital outputs also introduce unwanted noise. Whether developing or operating highly accurate PLL and clock circuits, A/D D/A converters, other linear precision circuits, Ground and VCC noise can significantly influence system functionality. 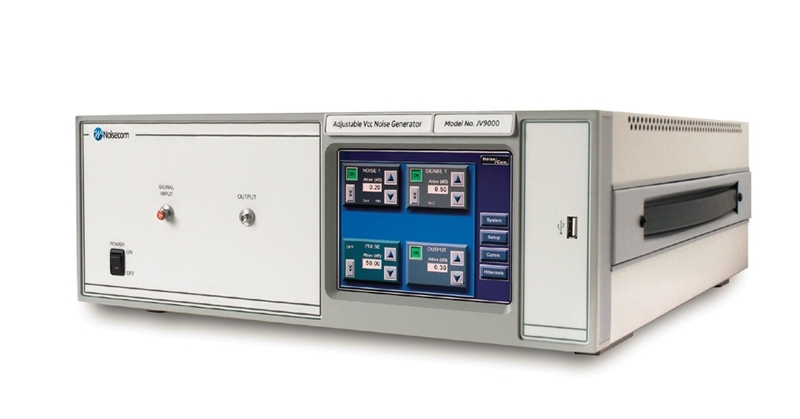 "Noisecom's new JV9000 generator is especially designed to test components that need to be qualified for VCC and GND noise interference immunity. Our generator has the capability to inject both, wideband noise and deterministic jitter (DJ) signals", said Wolfgang Damm, director of product marketing at WTG. "Leading chip manufacturers have show keen interest in the JV9000 as a way to establish a standardized procedure in testing their designs for the best VCC noise immunity". JV9000 generators are available as manual or computerized instruments. Both types deliver noise from 500 Hz to 2 GHz at levels from 0.01 mV to 224 mV (0dBm, 50 Ohms). JV9000 simulates DJ interferers within a signal frequency range from 1 kHz to 1 GHz (in steps). Customized input and output channels, as well as signal ranges and levels are available on request. JV9000 generators are available immediately.